This race really holds a special place in my heart and I'm thinking that I might have to make it my goal race every year. Not only was it my (way too longstanding) half marathon PR, and is now my newly minted PR half, but it was the subject of my first blog post. 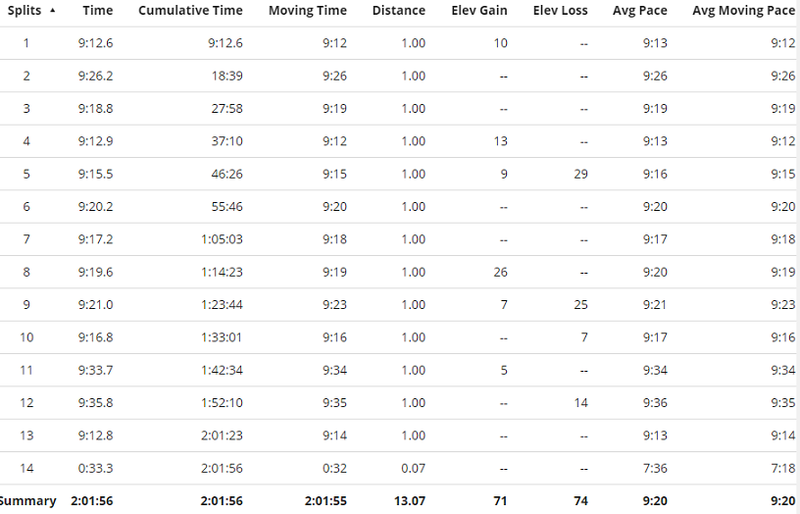 (I can't help but laugh at how I was describing my pace in mph instead of minutes per mile! I digress...) Looking back on that recap, one might wonder what took me so long to run it again. Well, the following year, I became an ambassador for Hot Chocolate and the Seattle race is always the weekend before Lake Sammamish. I already throw a bit of a monkey wrench into the family weekend with races, so two weekends in a row is not ideal. 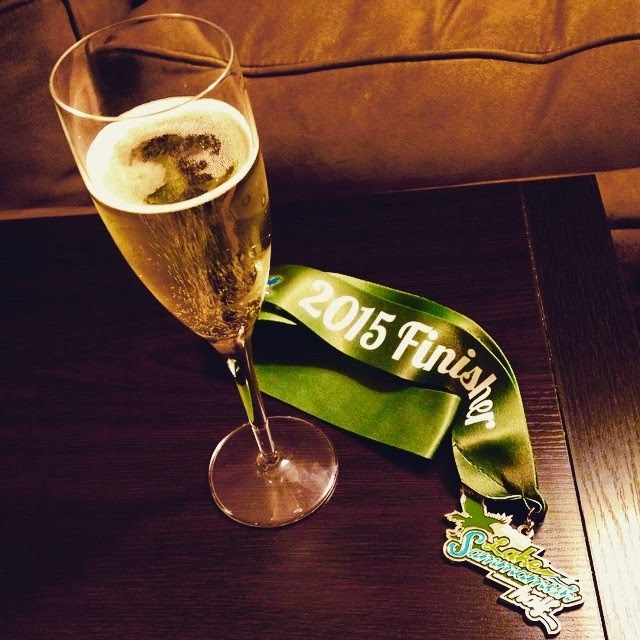 Plus, I wasn't sure about running a 15K the weekend before a half marathon. So, I put it on the back burner. Really, I spent a year putting half marathons on the back burner. As 2014 was coming to a close, and running was going pretty well for me, I decided that I wanted to put an honest effort into 13.1 again and I knew this was the race to target. I love that it's a 10 minute drive from my house (same with packet pickup), there is event parking for all (no stressful weaving city streets hoping for a spot), it's a point to point (no demoralizing out and backs), the buses back were well organized (EVERYTHING is well organized), it's flat but with some variety in the terrain (from gravel, to packed dirt, to road), there is Nuun on course, it has lovely views along the way and it's on a SATURDAY. Although, this year, I was suffering from a pretty bad head cold in the days beforehand and my son had been running a fever. I was pretty freaked out. With all the body aches, sinus pain, and sniffling, there were a few times where I thought I might just bag it altogether. But, I told myself to make a decision the morning of the race and not before. So I lazed around on the couch most of the day Friday hydrating and taking Tylenol. The night before, I took a 24 hour Sudafed (the kind you need to show your ID to purchase) hoping that I'd wake up free of sinus pain and able to breathe. 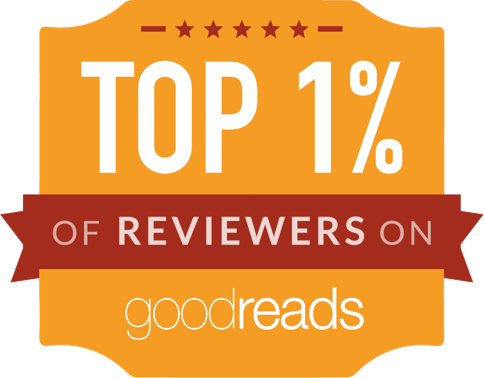 And, LO! I slept like a log and woke feeling pretty darn good at 5:30AM on race morning. I had my favorite pre-race breakfast of banana bread toasted with peanut butter and a nice strong latte. Then drove on over to Marymoor in the aforementioned 10 minutes with plenty of time to spare. 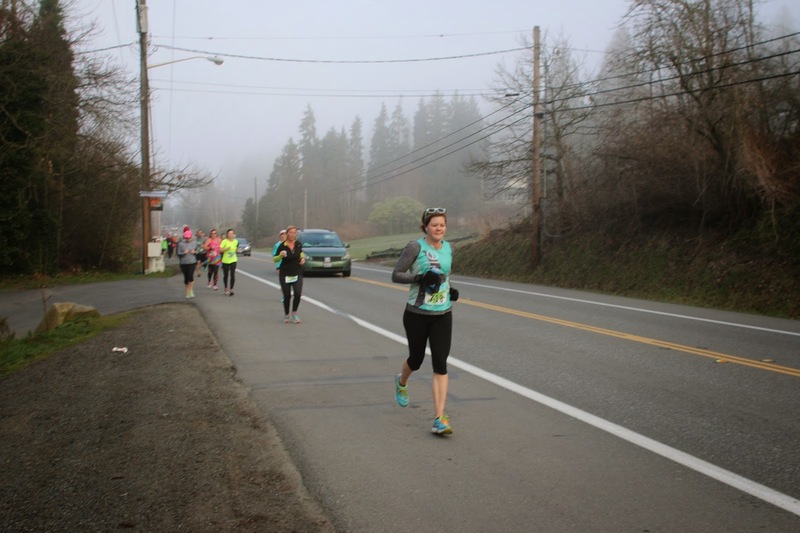 I sat in the car to stay warm and had a half a banana and a Nuun tablet in a very small amount of water, so I didn't have too much sloshing around in my stomach before the race. I finally left the confines of my car to hit up the bathroom and then line up. Running into Sybil and her running buddy was a great way to pass the time and calm my nerves before the start. Despite feeling a helluva lot better, I still thought I should take things easy and just get through the race without having a meltdown - my 'C' goal. My 'B' goal of sub 2:10 wasn't really even on my mind at that point. The plan was to do a comfortable effort by mile two and try to stick to that throughout the race. (The first mile is not a good gauge to base my race on, since it's usually a little too fast. Doesn't everybody do this...?) After running in the 9:20s for a bit, I started thinking I could still achieve my B goal and I pretty much settled into a comfortable pace for the duration. My one race photo, thanks to Woodinville Bicycle! In the official finish line photos, I was behind a group of people. Probably a good thing, though. The morning was really quite cold and my gloved fingers were feeling frozen up until mile 3 or so. But the sun kept peeking in and out and we ran through little pockets of fog that felt refreshing and lovely to view over the lake. I felt like I was getting my hydration by osmosis. By mile 10, I knew I'd be OK and just felt really great. By mile 11 and 12 the sun was out in full force and I started warming up, not necessarily in a good way. As I was fumbling with taking off my gloves and taking that last gel, I felt fatigue creeping in. But I just told myself to keep running miles that started with a 9 and I'd be good to meet that B goal, not realizing I'd settled into a pace that was more 'A' goal. This dawned on me as we hit that final mile, I looked down at my watch and thought I was hallucinating the fact that I could probably score a PR. Just in case my math was indeed correct, I switched gears from slightly fatigued 9:30 minute miles back to the 9:20 range and apparently into the 7:30s for that last .1 mile. My final chip time was 2:01:50, a 1 minute and 4 second PR. Given that final push, and the fact that I had not realized I was running close to PR pace the whole time, I'm thinking maaaaaybe I could have spread that effort more evenly over the first 12+ miles. I didn't feel like hurling afterward and even had water leftover in my handheld! Therein lies the thing that I could improve upon next time - because there's always SOMETHING. Don't get me wrong, I think this was my favorite race experience to date! The race itself and my execution were pretty much PERFECT: my fueling was on point from breakfast to evenly spaced water, Nuun and three gels throughout, the weather was excellent, the course was lovely even with a few miles on the road where the trail was closed, there wasn't much crowding, I love that the buses are at the end now - rather than the beginning of the race, and I kept a steady effort and met all my goals - even my A+++ one! 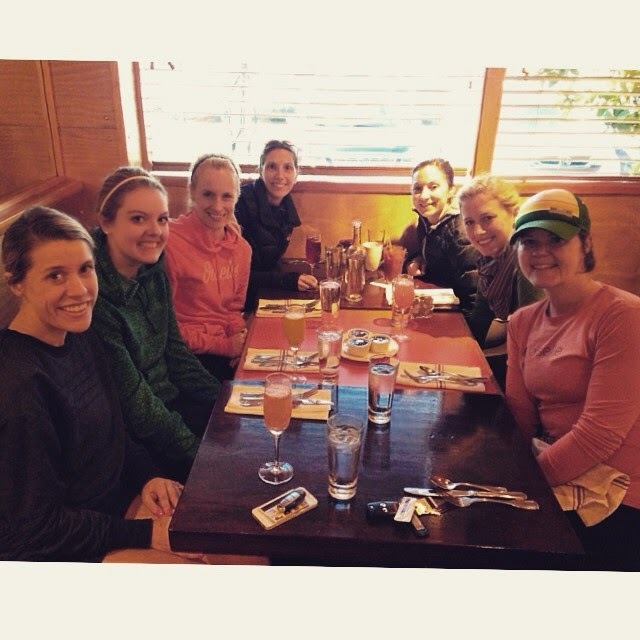 And yummy post race brunch was the cherry on the cake of my day! So, of course, I'm already chomping at the bit to do it over again WITHOUT coming off a horrible cold and with more confidence that I could kick it up a notch without crashing and burning later on. But I may just leave this race as my goal half every year and run the others for fun, because it is just that awesome. Thank you Lake Sammamish Half Marathon for giving me back some much needed 13.1 confidence! Cheers! Congratulations on a great race and new PR! PRs are even better when they are unexpected! Great job on your PR! I haven't run this race before, maybe something to think about next year;) I'm doing the Seahawks 12k and the Mt. Si relay in April. Have you ever done these races? Thoughts? The Beats Half Marathon Discount Code!